This is a first feature film from writer/producer Drew Pearce, whose credits include the screenplay for “Iron Man 3”. Despite a modest budget by Hollywood standards – a “mere” $15 million as opposed to an estimated average for an action film of $100 to $150 million – Pearce has managed to attract two major stars to the project. Jeff Goldblum in an effective supporting role and Jodie Foster in the lead. Foster plays the Nurse, who runs the hotel of the title, which isn’t really a hostelry at all but a secret, members only, high tech medical repair shop, where criminals can get themselves patched up when wounded on the job. The Nurse runs the operation according to a strict set of rules, which include no killing the other patients, no weapons allowed and no fighting in the corridors – all of which are broken in the course of the story’s often very violent action. Clients’ anonymity is preserved by code names. They include Waikiki (Sterling K. Brown) who brings in his brother Honolulu (Brian Tyree Henry) badly wounded after the bank robbery, which forms the opening sequence and is an almost comic example of total incompetence on the job. The story is set in a Los Angeles of the future where outside a continuous riot blazes unchecked. Things come to a head when the volatile Crosby (Zachary Quinto) brings in his crime boss father, codename Niagra (Jeff Goldblum), who has been badly hurt after an assassination attempt. 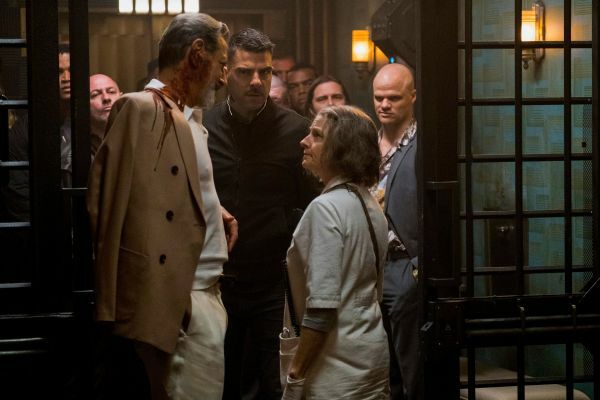 There are some very imaginative aspects to the film, most particularly the hotel itself, which is a run down, art deco building reminiscent of old movies from the thirties, whose elegant décor contrasts with the high tech medicine – most imaginatively a 3D printer which can print out a new human liver – metal doors and gloomy corridors. All praise to Foster, who discards all film star glamour and is charismatic as the frumpy, fierce and heavy drinking Nurse, stumping around with a determined old lady walk. We learn comparatively little about her, apart from the fact that she once had a son, who died and has a somewhat murky history with Niagra. Most interesting is her relationship with her bodyguard Everest (Dave Bautista), so called because he is built like – well – a mountain. He has the amusing and rather endearing habit of proudly describing himself as a “health professional” before laying violently into anyone who threatens the status quo. There is also some dryly funny dialogue, particularly from Goldblum, who specialises in the laconic and who makes a short but effective contribution to the proceedings. There is also a French female assassin Nice (Sofia Boutella), whose purpose takes a long time to be revealed but who is notable for her ability to deal with unwanted advances from smarmy arms dealer Acapulco (Charlie Day) in a manner which would put Harvey Weinstein firmly in his place and to do spectacular karate moves, while wearing a dramatic, red. multi split evening gown. The originality and imaginative nature of the concept however eventually gets overwhelmed by the violent action, which muddles the clarity of the narrative. And some of what I suspect is rather good dialogue is drowned out by the mayhem.